Crush Soda- Did you all know that Crush is caffeine free? Yeah. It is. Sunkist isn't but Crush is. It was like a match made in pregnancy heaven. I declared at work yesterday that it was the greatest fact EVER and that I could now drink seven Crush sodas a day! Justin pointed out that seven might be a little excessive, even if they are caffeine free....whatever. Salads- Oh yes. This one is still hanging around. This is my longest running craving. Yes, hard to believer but LONGER than the one week obsession with the Firehouse. Not much to say except I love Salad. Just don't put to many nasty veggies on it and make sure to double the dressing. Yum. And that's it my friends. I am sure I have other things, but this stupid cop-out post turned out to be a lot of work what with the pictures! 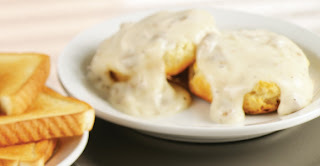 Also, apparently there is not an appetizing picture of Gravy and biscuits on the entire Internet. How sad for my favorite food....and a final also, do ya like how the pics are totally all different sizes? Yeah, me too. I am so talented. OH orange Crush was definitely one of mine too. It popped up right after I had to go drink the orange fizzy drink at the OBs to see if I had diabetes or not. Did yours start then too? 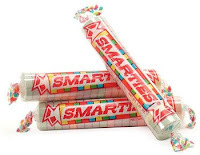 I had really bad cravings for Smarties when I was pregnant, too! How funny. I had a sweet co-worker who would keep the candy jar fully stocked. Got to love those cravings. I did when I was PG. I loved strawberry shakes and fries. I didn't know Sunkist has caffeine! For some reason I just assumed it didn't. No wonder hubby couldn't sleep when he was drinking it all the time! Thanks for the info! Mine are sprite and ice cream (not together). Also, your 'Smarties' are called 'Rockets' in Canada. I LOVE those.